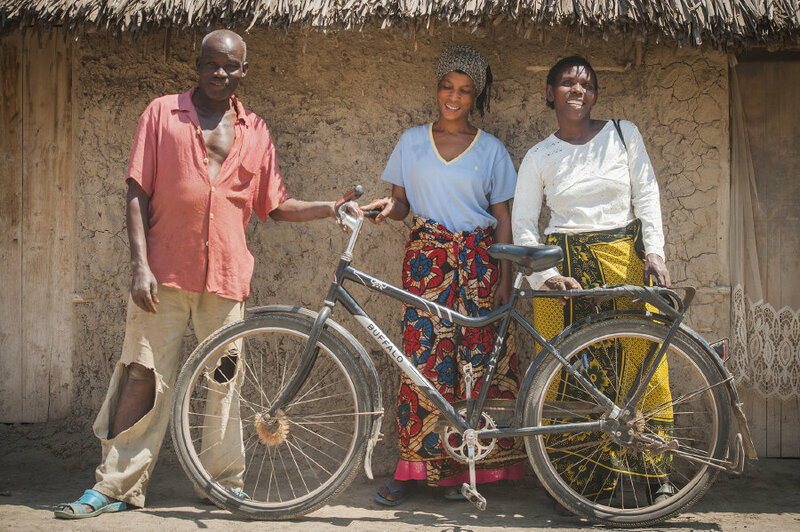 For the first time ever, we’re collaborating with the non-profit organization, globalbike, to bring you a tour that combines service, cycling and safari in Africa. 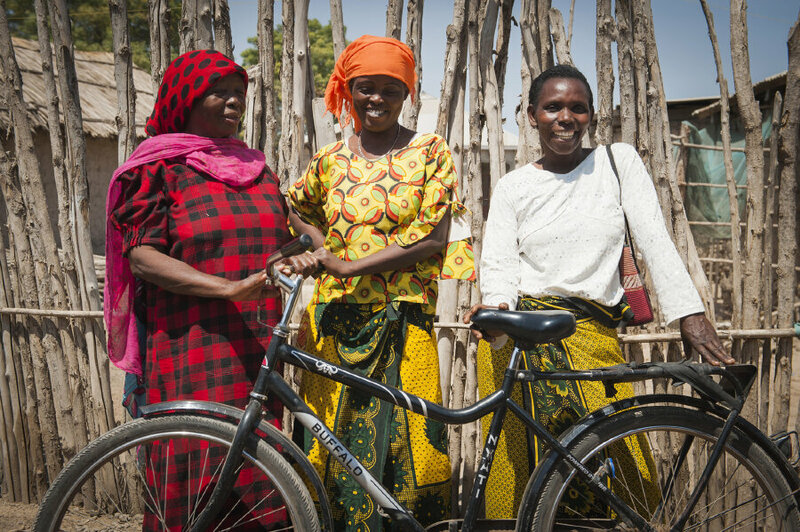 During our time together, we’ll learn how globalbike works to make bicycles accessible to Tanzanian women as a means to improve their health and well-being. We’ll shift gears during the second half of the tour to experience once-in-a-lifetime “game biking” into the heart of the world-famous Serengeti. This is the stuff of dreams, and we feel privileged to help turn them into reality. Join us as we share our collective appreciation for the bicycle with our Tanzanian sisters. All tour proceeds will go to Tanzania and globalbike. Flat and small rolling hills on unpaved dirt roads. Moderate cycling level. 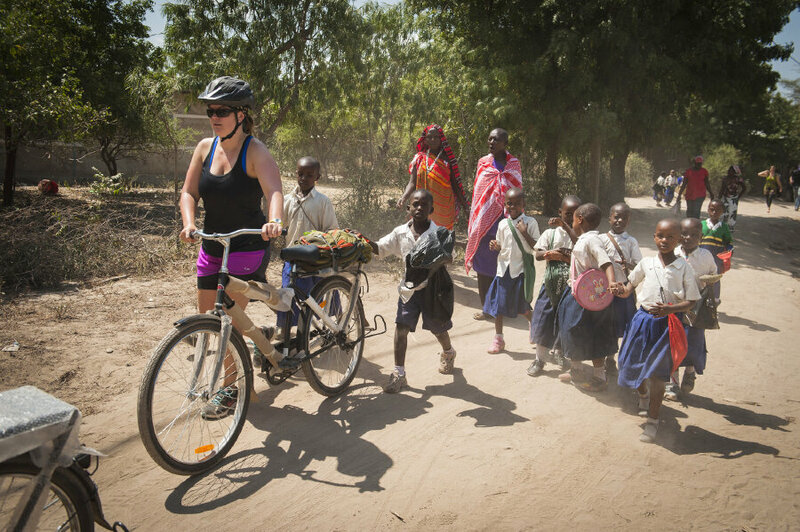 10 nights lodging, 10 breakfasts, 10 lunches, 9 dinners, water, luggage transport, van support, bicycle, "game biking", 4x4 safari excursions, community engagement activities, trained bilingual guides, airport transfers and contribution to globalbike. Hybrid "Buffalo Bike" and mountain bike are included. Fly round-trip to Kilimanjaro International Airport, Tanzania. DAY 1: We’ll begin our adventure together with a shuttle from the Kilimanjaro Airport to our lodge just outside the town of Moshi. Most flights arrive late in the day, so you’ll enjoy a recuperating evening beneath the shadow of Africa’s tallest mountain. 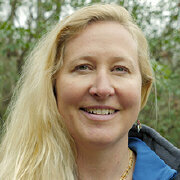 Moshi is the start for many adventure-seekers vying for a summit bid of Mt. Kilimanjaro at 19,341’. 0 miles. DAY 2: We ease into our tour with a relaxed morning spent touring the grounds and learning about one of Tanzania’s sustainable coffee farms. Perk up on some home-grown coffee – as fresh as it gets – and then spend the afternoon back at our lodge. We’ll join our partner, globalbike, for an evening meet and greet. 0 miles. 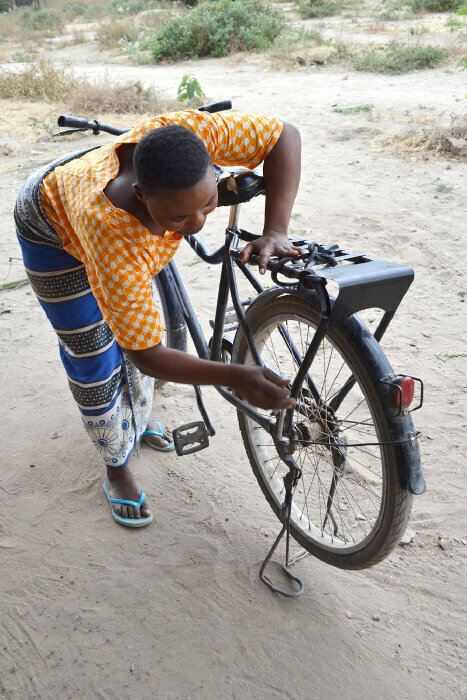 DAY 3: For the next three days, we take to the Kilimanjaro countryside with globalbike’s rugged Buffalo Bicycles, designed to withstand the rural terrain and carry 200 pounds. Our first stop lands us at the Tusidiane women’s cooperative, where we’ll learn about their bike rental program, small business projects and water sourcing initiatives. As the sun sets, we’ll gather for a fireside chat and debrief with globalbike. 3-4 hours cycling. 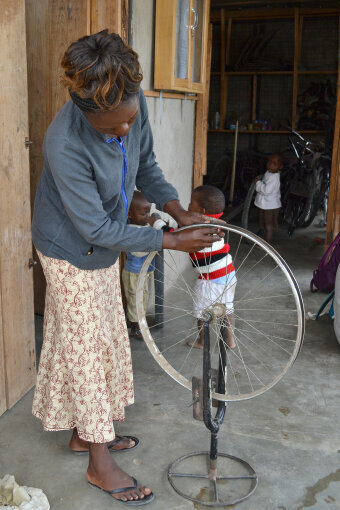 DAY 4: After breakfast, we bike to the village of Mikocheni to visit the Enaboishu women’s cooperative bike shop, the very first of its kind in the region. We’ll spend the afternoon participating in hands-on activities to learn about life here. We may practice carrying water like a local—both on and off the bike, or we may visit a market or fishing lake to learn the value of the bike from the merchants and fishermen themselves. 3-4 hours cycling. DAY 5: We continue cycling through rural Tanzanian countryside today to visit Msitu wa Tembo, home of the Kazi Na Sala women’s group and bike shop. 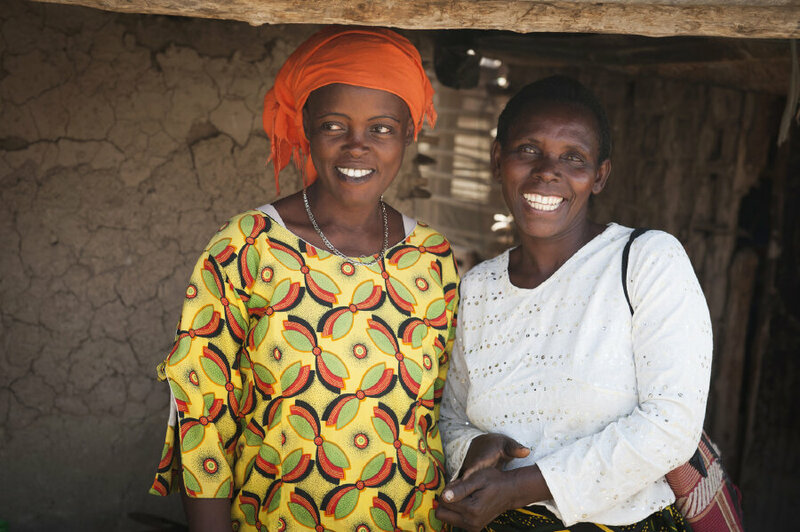 The group’s name means “Work and Prayer” in Swahili, and its members work to empower women in the community. We’ll also meet with the TATU Project, whose mission has helped women launch sustainable businesses in the arts. 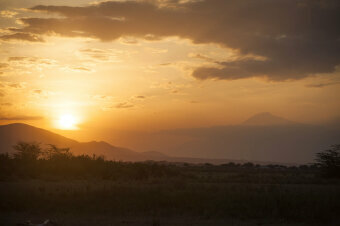 After our full day, we’ll shuttle to north Kilimanjaro and settle into our first safari lodge. We’ll have breathtaking views of Kilimanjaro National Park and the Amboseli plains from our private terraces. 3-4 hours cycling. DAY 6: After a hearty breakfast, we embark on a new phase of our journey centered around exploring the wonders of the Tanzanian wildlife. 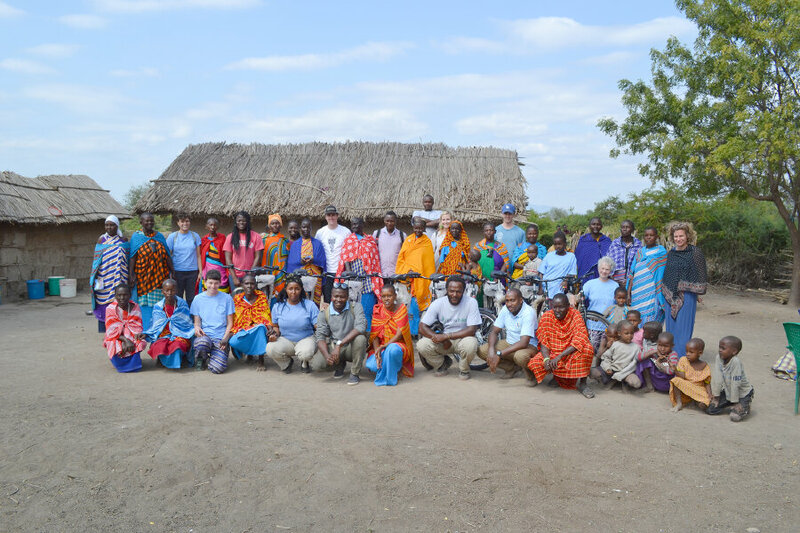 We begin at the Enduimet Wildlife Management Area, a preserve shared and operated by the collective efforts of nine separate communities. As we set off on our first “game biking” experience, we’ll hope to encounter elephants, giraffes and gazelles, among others. 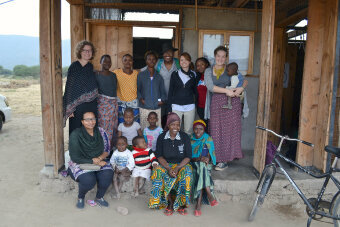 Surely, we will return with stories to exchange back at our “camp”! 3-4 hours cycling. DAY 7: We start the day early with another game bike ride to look for wildlife. 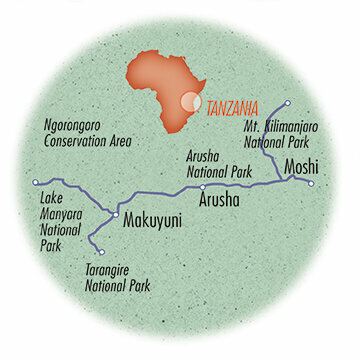 Then we’ll travel south to Arusha National Park, home of Mount Meru, the second highest peak in Tanzania. Here, we’ll hop in 4x4s for a game drive through the park, famous for its waterfalls, lush tropical forest, marshes and open plains. Keep your eyes peeled for pink flamingos, black and white Colobus guereza monkeys, or if we’re especially lucky, leopards and lions! 3-4 hours cycling. 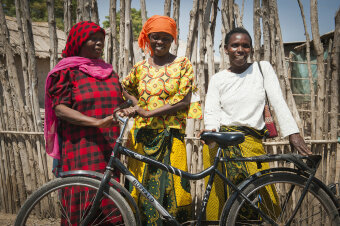 DAY 8: We continue our journey with a bike ride into Tarangire National Park today. Once in the park, we board 4x4’s to explore the greater ecosystem, whose river is the primary source of fresh water for thousands of migrating wildebeest and zebras and sustains a thriving elephant population. Gaze up at the towering baobab trees, whose trunks can store up to 100,000 liters of water and provide an important resource to elephants during the dry season. Tonight we go “glamping” under the stars in beautiful canvas tents at our next safari lodge. 3-4 hours cycling. DAY 9: On our early morning game drive back to Tarangire National Park, we will scan its fertile river valleys and expansive savanna for lion, leopard, cheetah, honey badger, and the African wild dog. We then shuttle to our farm house for lunch together, and the afternoon is yours to freely enjoy. 3-4 hours cycling. DAY 10: We set out at sunrise to get our first glimpse of the Ngorongoro Conservation Area, a UNESCO World Heritage Site. It’s famous for its 2000’ deep crater - the world's largest unfilled and intact caldera of its kind. The crater spans five different ecosystems including grasslands, pools, marshes, a salt lake and forest, so it's home to a tremendous diversity of species. We'll hope to see some of the thousands of wild animals, including the endangered black rhinoceros, hippopotamus, and the highest density of East African lions in Tanzania. You will probably never see as many animals coexisting freely anywhere else in the world. We'll celebrate our experience together over a farm-to-table dinner back at the farm house. 0 miles. DAY 11: After breakfast, we’ll leave the wilderness behind and shuttle to the city of Arusha. We'll explore the streets and do some last minute shopping. Then we’ll say our goodbyes after lunch and a shuttle back to the Kilimanjaro airport. 0 miles.